w. 4 3/4 in. by h. 5 1/2 in. Nicholas was born in Budapest, Hungary in 1896 and studied portrait painting at the Budapest Academy of Fine Arts under Edouard Ballo; etching in Antwerp, Belgium; Paris; Vienna and Munich. He came to Toronto in 1929 where he remained active until his death in 1965. He is best known for his colourful aquatint etchings of the rural scenery, buildings and streetscapes of Ontario, Quebec and the Maritimes. Hornyanski developed his own unique single-pull positive-approach aquatint process and also worked in watercolour, gouache and ink. He taught printmaking at the OCA and was president of the CPE. He was a member of many American art associations including the American Color Print Society in Philadelphia, and was also a Life Fellow of the International institute of Arts and Letters. 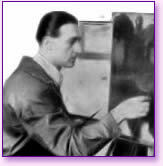 Hornyanski exhibited with the RCA and the AAM, and a retrospective of his work was held at the Tom Thomson Art Gallery in 1978. His work is represented it the collections of the Library of Congress in Washington, NGC, ROM and the Museum of Fine Art in Antwerp.